View a video of the Crystal Palace tower illumination here. 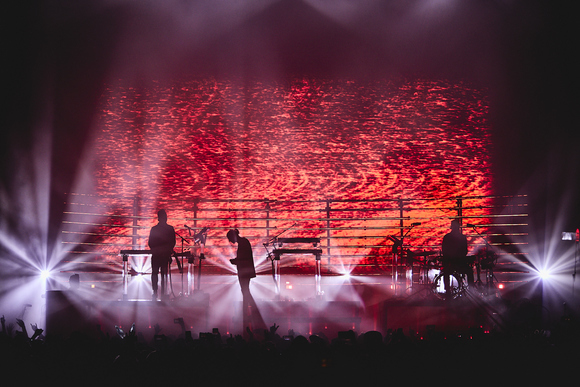 On the evening of April 18th, Martin Professional lighting was used for spectacular visual impact at a high profile event marking the switch from analog to digital TV in London. Arqiva, the communications infrastructure and media services firm responsible for engineering and delivering the digital switchover project (DSO) in the UK, hosted a special VIP event which culminated in dynamic illumination of the 219 meter high Crystal Palace broadcast tower in southeast London. Arqiva contracted leading event production and branding specialist company Icon to stage the light show and VIP celebration. Richard Dale, managing director of Icon's event production division, explained Icon's involvement. 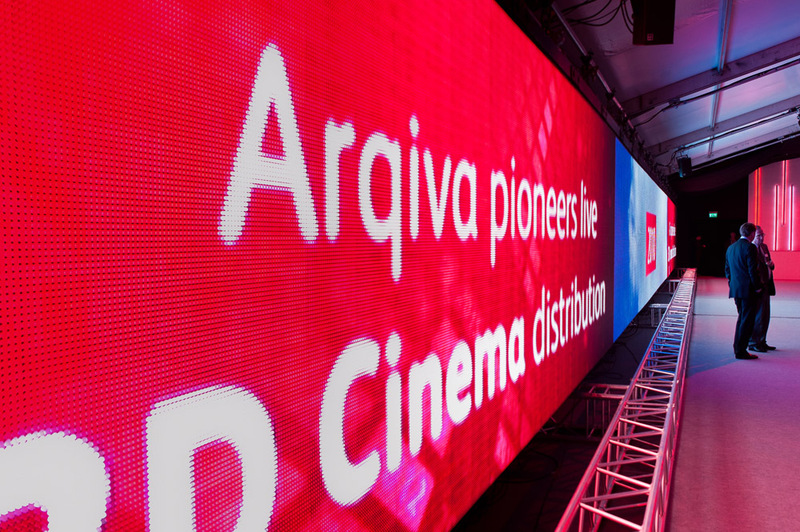 "Arqiva wanted to celebrate not only the completion of their five-year digital switchover project but also to use the event as a chance to celebrate the history of broadcasting in the UK and to look into the future of an enabled digital Britain. Working with Arqiva's senior management team since the inception of the project allowed us to fully understand the strategic importance of this landmark event in British broadcasting. With this knowledge we were able to design and deliver a truly unique and spectacular VIP event." Hosted by broadcaster Chris Evans from a hospitality suite at the foot of the tower, the VIP event featured a talk by Sir David Attenborough who spoke about the evolution of broadcasting during his 60 years in the field. To further highlight broadcasting’s history while heightening the nostalgic atmosphere in the suite, a 36 m wide x 3 m high Martin Professional EC-10™ LED video screen was used to stream imagery from popular British TV broadcasts and shows over the years. 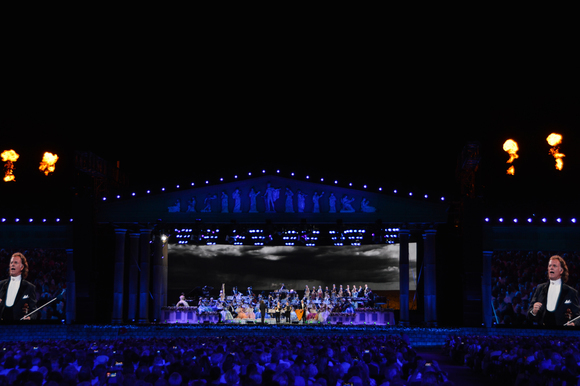 The EC-10 screen, which was driven by Martin’s P3-200 video processor, was supplied for the event by Martin rental partner HSL. Attenborough had the honor of pressing the button that triggered illumination of the Crystal Palace broadcast tower in a blaze of color, marking the end of 75 years of analog TV broadcasting in the region. The tower was set aglow in color changing light from Martin Professional Exterior 1200 Washes, programmable IP65-rated 1200 W luminaires with CMY color mixing system that excel in the uniform distribution of light and color. A part of the tower illumination included a Martin LED video screen which was mounted on the tower itself. A 12 m wide x 3 m high Martin LC Plus™ screen with IP65 protection, supplied by HSL, was suspended inside the legs of the tower from the 65 m gantry and used to display the Arqiva logo. A variety of 7 kW and 8 kW lights and other dynamic lighting was also used on the event. The light show, which culminated in a beam of light that shot up the tower and across London, representing invisible digital TV signals, was repeated several times after the event.